A decadent roast is a holiday staple, but just because it’s the most impressive thing on the table doesn’t mean it needs to take a lot of effort. A decadent roast is a holiday staple, but just because it’s the most impressive thing on the table doesn’t mean it needs to take a lot of effort. Here, eight excellent roasts that can be prepped in 20 minutes or less, then left alone to cook while you do more important things—like open up the Champagne. Coffee and prime rib make an unlikely but deliciously earthy pair. Coasted with horseradish and black peppercorns, this simple roast is perfect hot out of the oven and also served cold on a sandwich. Chef Ryan Hardy first tasted a version of this pork in Siena, Italy; in his iteration, he often wraps a piece of pork belly around the side to make the meat extra juicy. Chef Luisa Weiss uses maple sugar, ginger and crushed red pepper to make a sweet-and-spicy marinade for this pork loin. Drawing on fiery Mozambique condiments, chef Marcus Samuelsson uses paprika, ancho chile and ground cardamom to season lamb. 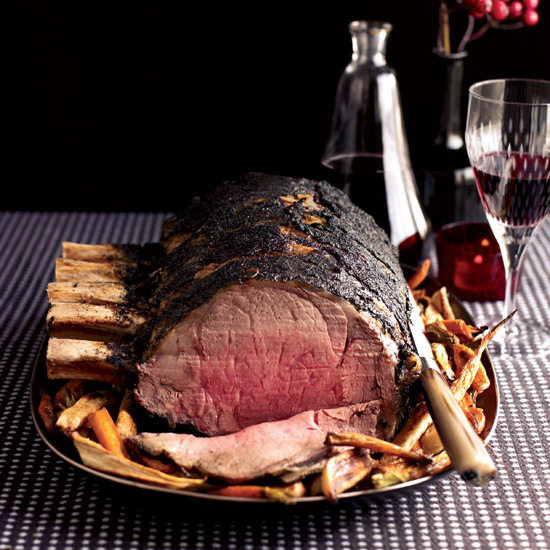 The flavors in this classic lamb roast are brought out with mustards, shallots and thyme. A mix of soy sauce, ground chile, garlic and peppercorns coats the meat with a peppery crust as it roasts. For the pescetarian table, a succulent red snapper can be seasoned with Asian, Mediterranean or Caribbean flavors.